Some people never give up, and in this case, we mean Ben Chan and Gino Gonzales. The Ternocon at Cultural Center of the Philippines went one step further in promoting the national dress as relevant wear for today’s Filipino women. Not only did it parade in a fashion show last Sunday the terno designs of the participants, who were mostly budding designers, from various parts of the country; the Ternocon mentored these participants in the design and making of the terno. Gonzales went to the provinces to mentor the participants, and in Metro Manila, he was joined by seasoned designers JC Buendia, Len Cabili and Inno Sotto in giving the workshops. To my mind, this was the first time terno-making workshops had been given that extensively in preparation for a fashion collection. Some years back, Inquirer Lifestyle “Face-Off” staged the milestone “Masters vs Millennials” to showcase the maria clara designs of veteran designers and millennial designers. Of course, while both generations displayed utmost creativity, the millennials remained in awe of the technique and construction of the masters in doing the maria clara. But the veterans didn’t share knowledge with the millennials. Apparently, as a result of the mentoring, the Ternocon yielded polished collections and experimentations with materials (e.g. solihiya weaving). Gonzales told us that one participant, Dave Datoy of Gen San, had never even sewed a dress before Ternocon; he was just mentored by Sotto. And ironically, Datoy’s was one of our favorites—a burgundy empire-cut terno, multi-layered (organza or tulle), with hand-embroidered prints of coconut trees, heart, sun, fruits. It was whimsical, hip, wearable—and not traditional. We would have wanted the less traditional but wearable designs to win, to show how today’s generation of designers could tweak the terno—including its silhouette—without going overboard or being gimmicky. That brings us to the point of the whole Ternocon: how indeed do you make today’s women wear the terno in their everyday lifestyle? Can they? Should they? Last Sunday’s guests came in their terno, although not necessarily in the day terno (not floor-length) specified in the invite that came with a sketch of the day terno and its components (panuelo and all). The women were either in the traditional long terno, or in the more casual-looking day terno that fell at midcalf. It was impressive how the women, with their designers, gave the terno their individual interpretations—and glammed up on a Sunday at that. So yes, it seems today’s women are eager to reserve the terno a place in their wardrobe. But how do you wear the terno not only to Filipiniana or special “ninang” occasions, but also to other dressy, even casual, affairs? JC Buendia, in his Ternocon portion, deconstructed the terno into separates—simple tops and skirts, in indigenous weaves and embroidered piña. Some terno tops hung at midrib—the look was so hip and young. The inabel skirts were draped, falling just below the knee. Definitely, Buendia and Cabili’s terno, in accessible fabrics (like cotton), with indigenous prints, will find a market among today’s women. Ramon Valera did, among women in the ’50s. I remember collector Dr. Eleuterio “Teyet” Pascual, years ago, one idle afternoon when we had nothing better to do, making me try on his Ramon Valera day terno. It was mid-calf, draped at the side, in printed cotton, with perfect-fit sleeves. Teyet knew I would fit in it—such was his unstinting faith in me. Auggie Cordero has an idea that takes the terno a step closer to daily wearable chic. Collapse its sleeves and turn them into billowy but soft puffs. “Face it, women will find it hard to wear the stiff terno sleeves to cocktails, much less to board meetings. The less costumey it looks, the better. Hard to raise your arm and use the cellphone,” said this designer who has yet to use a mobile phone. But he’s right. Those terno sleeves can be cumbersome. And for a panuelo, Cordero used strips of fabrics on the bodice—an abstract representation of this terno component. He gave the knee-length silk terno a pouf hem, with black lace draped on the skirt. Years ago, as designer at Harrods, Lesley Mobo shrunk the terno sleeves for Anne Hathaway. One must remember that Valera modified the terno, even if he got flak for it in his time. And Salvacion Lim Higgins raised the bar with her unorthodox treatment of fabrics, and a construction that was a marvel of fashion engineering. To turn the terno into everyday wear, Ternocon, next year, could push the boundaries of fashion, encourage the participants to play with its silhouette/proportion, not just with ornamentation, or even deconstruct it, although a budding designer must know how to construct the terno before he can deconstruct it. Ternocon could push the envelope, even as it remains grounded in Philippine culture. 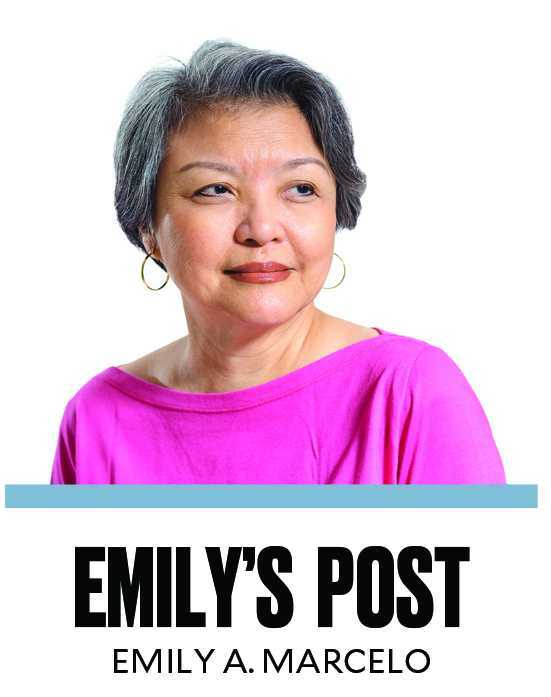 There was nothing as enthralling as listening to the Philippine Philharmonic’s strings play the kundiman last Sunday, the well-loved Filipino music you haven’t heard in a while, certainly not in a fashion show. It was something to give up one’s Sunday for. Now, Gino can get some rest. Previous Vogue HK editor in chief a Filipino?